With Tony Stark coming up with a good excuse of being missing over the past year and Iron Man returning to the main universe with the other lost heroes, there’s debate over whether or not Stark will reclaim his company from Fujikawa. Of course everyone has their own opinion but Tony doesn’t know what he wants to do. Then while taking a walk after his celebration he is attacked by a heavily-outfitted assassination group called the Death Squad. He barely manages to escape them long enough to put on his armor and although they seem prepared for him Iron Man manages to run them off. However, the construction site for a new building to house those displaced during Onslaught is destroyed. So now Tony knows what he wants to do: instead of reclaiming his old company he starts a new one, Stark Solutions, a consulting company with proceeds going to the Maria Stark Foundation, along with a warning from Iron Man that he’ll still be protecting Tony. This brings different reactions from his many enemies, but which one hired Death Squad? What they got right: I don’t know how much Tony remembers from his Reborn self but you may recall from my reviews a long time ago that Reborn Tony was the kind of jerk…they write him as today, honestly. It was only after he shared the fate of his previous self that he tried to be a better person. Plus Tony’s been gone from the main universe for a year, so not being sure he should disrupt things is a good premise for his return. And I honestly like the direction Busiek gave Tony. 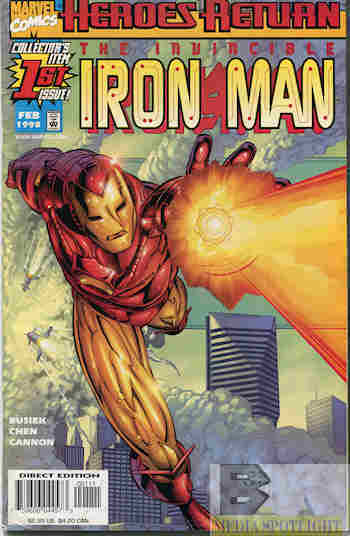 It had a new opportunity to tell different stories in new locations, showcase Tony’s brains as much as his armor (which we also see here in both identities like vaporizing the glass shards from when he drops in through the skylight so hostages don’t get cut), and is growth for the concept and character. The idea will be dropped way too early but that’s a complaint for the future. What they got wrong: There are a couple of panels where it looks like the art was stretched, making Iron Man look a bit bulky, plus a scene where he drops in on the hostage situation I mentioned in which (and this could be the stretching again) the perspective of Iron Man coming down looks flat. This is even more noticeable because the rest of the art, from the drawing to the coloring, is just so darn good that these few panels stand out even more. It’s too bad we don’t know what colorists were used since Marvel went with one of the comic coloring companies that popped up in the 90s but I find it hard to believe Chen and Cannon messed up those panels given the rest of the book. It sure beats what was done to them in the past year by Liefeld and WildStorm. (I think WildStorm had Iron Man.) I also want to know why the letterer (we only get initials and I didn’t feel like looking it up) opted to make some words red in the captions. I’d say it was because those were words Tony was stressing (which can be done right if the writer and letter know what they’re doing, like in here) in his memoirs or whatever the captions are supposed to be doing in place of the usual narrator but why not bold like in the rest of the dialog? Recommendation: A great return from Iron Man, already clearing out the garbage of Heroes Reborn and what could have been a good new direction for Tony Stark and Iron Man had they stuck with it. Get this comic if you see it. Posted by ShadowWing Tronix on December 5, 2017 in Marvel Spotlight, Yesterday's Comics and tagged comic review, Eric Cannon, Heroes Reborn, Iron Man, Kurt Busiek, Marvel Comic, Marvel Universe, Sean Chen, Tony Stark.